It's not often I dislike a colour but unfortunately today I have for you a shade that I just did not like on me AT ALL. And it pains me to tell you that it is a lovely Butter London lacquer but there are just colours that don't suit everyone! Application was flawless and the lacquer itself is beautiful. Only 2 smooth coats needed for opacity and it dried to a glossy finish. The brush is easy to use and handle and no cleanup was needed. 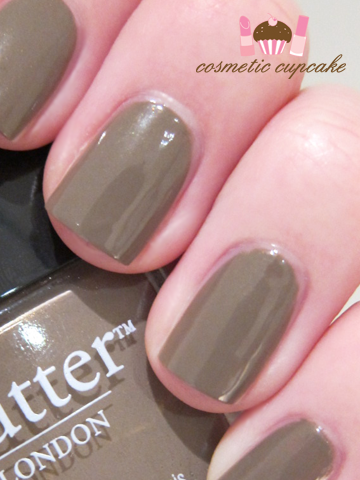 Butter London polishes are also Big 3 free which is fantastic and I love the shape of their bottles. These rectangular shaped bottles look soooo nice in my helmer haha. I just didn't fancy the colour on me unfortunately and I would have taken it off straight away had it not been nearly midnight when I painted my nails so I had to endure a day of work with it on x) I got asked what was with my "muted" polish today haha! I'm sad because it's a beautiful lacquer but the colour just doesn't suit me! Are there colours that you find just don't work for you and avoid wearing? I am so glad I finally found a Sydney blogger! You are a rare breed. I thought the shade look quite nice on you in the picture. For me, its bright pinks and reds, no matter how nice the colour look in the bottle, it just looks wrong on my nails. i think this shade looks nice! perfect for winter days. I personally love it on you! I have that polish... it's not for me either, I found it chipped VERY easily and the color just didn't feel right. Oh no, I think it looks great on you! I really wish I had picked up the free bottle of it when I had the chance. Coincidentally, a friend had this on her nails yesterday at uni and I was just admiring them. Mmm, this looks great on you! Who was the winner of your giveaway?